Jessica Calderwood’s work invites viewers to dive deeper. Published on Monday, March 18, 2019. This article appears in the February/March 2019 issue of American Craft Magazine. How much of our true selves do we show to the world? When we look at others, do we see who they really are? Can we ever know what lies beneath the surface? 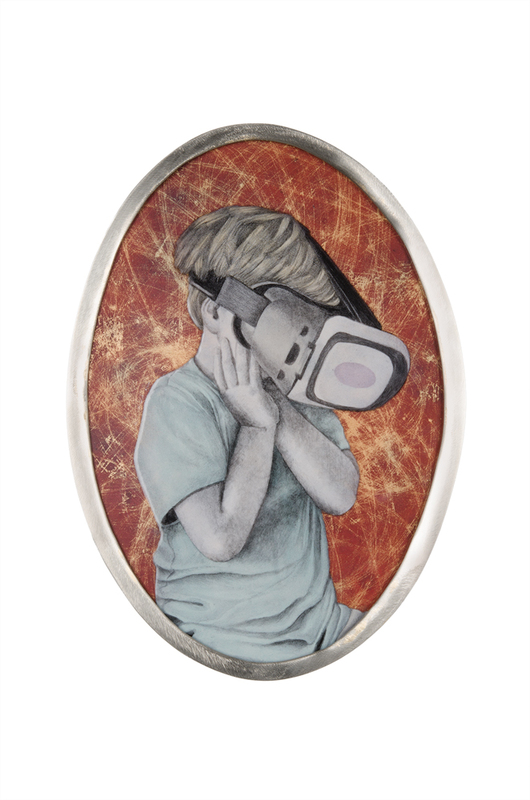 In her enameled paintings and jewelry, Jessica Calderwood captures imaginary characters in private moments and intimate places, with unguarded gestures: face in hands, fingers in mouth, belly button in extreme close-up. Surreal and enigmatic, her portraits have humor, attitude, and charm, but they’re also unsettling, for what they reveal and what they don’t. 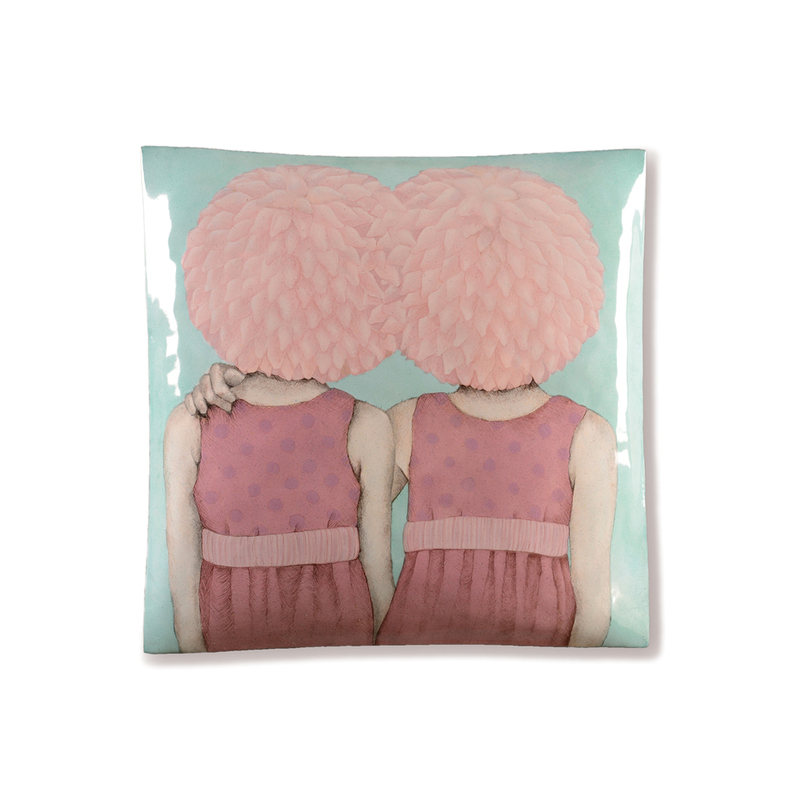 Her long-standing Florals series shows female figures in soft pastels, demure dresses, strands of pearls. They’re lovely and ladylike in the old-fashioned sense, yet incomplete. 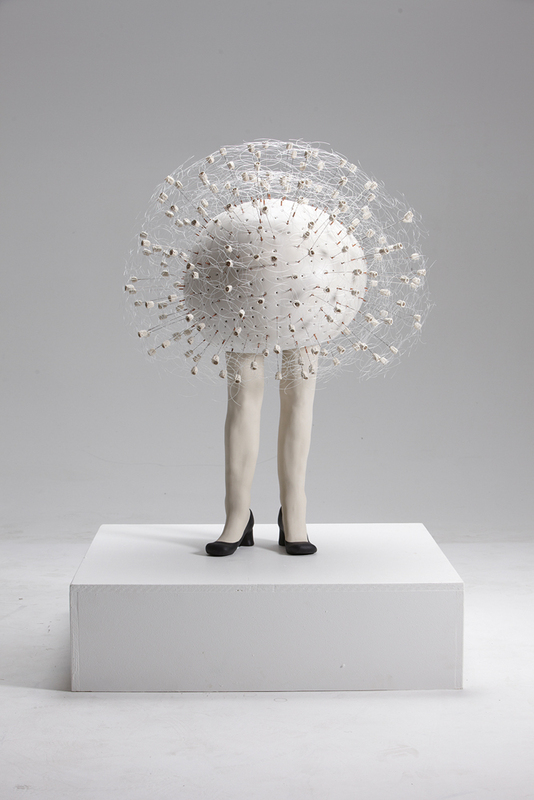 In place of heads, they sport absurd botanical bursts – a bouquet of blooms, a puff of dandelion seeds, an artichoke. These human-plant hybrids are frozen in gestures of doubt and quiet despair. Even when they come in twos, as twins or mirrored, they’re essentially alone, personalities negated, in spaces devoid of outside influence. That these images are created in layers – rendered in powdered-glass paint on a shimmery metal substrate, fired dozens of times to develop complexity – adds to their dreamlike depth. Houseplants, diptych, 2016, enamel, copper, brass, ceramic decals, enamel paint, 2.5 x 5 x .25 ft. 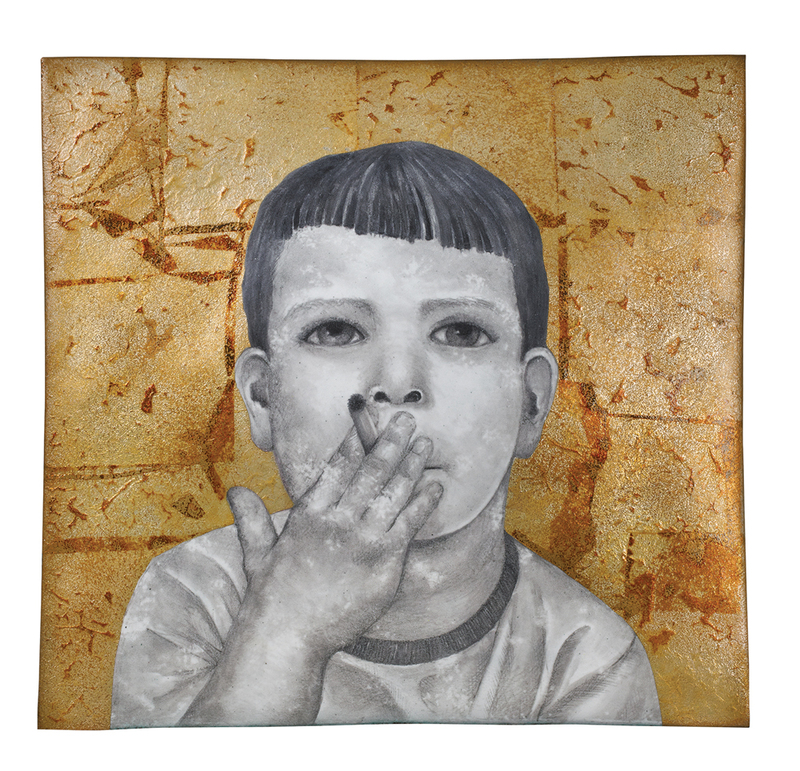 Smoking Boy (2005) sets an image of a vice against a quasi-religious gilt background. The subject’s youth makes it more disquieting. Red Drape, 2018, enamel, copper, vitreous china, stainless steel, sterling silver, milk paint, 8 x 4 x 4 in. The bulbous cloak – a flowerhead gone to seed? – hints at what this pair is up to in Propagation (2015). 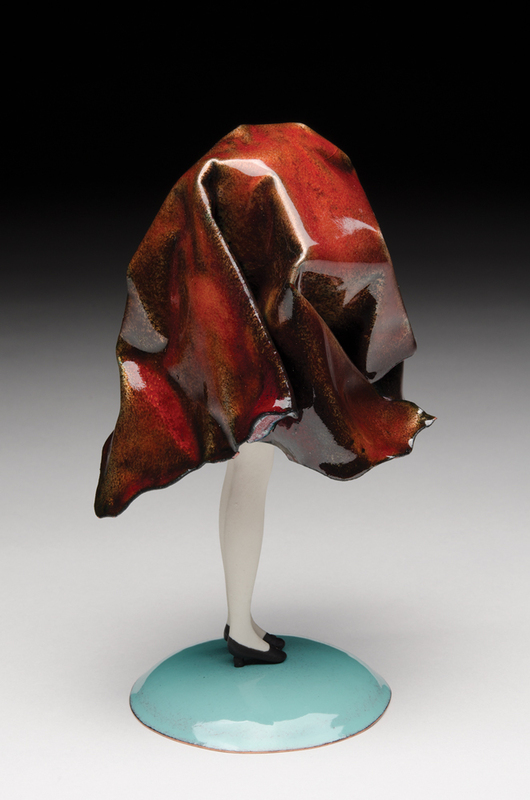 Seedy Woman, 2014, vitreous china, milk paint, stainless steel, copper, monofilament, resin, 4 x 2.5 x 2.5 in. Coupled II, 2017, enamel, copper, underglaze, china paint, 17 x 17 x 2 in. Square, 2017, enamel, copper, porcelain, sterling silver, head pins, milk paint, 8 x 6 x 4 in. Zane, 2018, copper, enamel, nickel-plated brass, china paint, 14 x 10 x 3 in. Asexual Brooch (2016) shows the seamless blend of technical skill and thematic depth that draws viewers in, Calderwood’s stated goal. Gender, identity, and the body are themes Calderwood, 40, has mined in her art for two decades now, in personal, autobiographical ways. When she put her career as an artist and teacher on hold after the birth of her first child, she sensed a difference in the way people perceived her. “All of a sudden, I wasn’t anybody but ‘Mom,’ and it felt isolating,” she recalls. “I had to somehow address it.” On summer visits to her Moroccan-born husband’s family home in Rabat, she spent hours sketching plants and flowers in her mother-in-law’s lush Mediterranean garden. “I had pages of studies from years of trips. It marinated for a long time, until I realized the symbolism of the floral and the feminine,” and a rich body of work was born. Later, she would expand on the motif of concealment and censorship by portraying her subjects’ faces behind drapes. It’s fitting that she hails from Cleveland, Ohio, for decades the center of enamel art in the United States. That distinction is largely thanks to the legacy of Kenneth F. Bates, the so-called dean of American enamelists, who taught at the Cleveland Institute of Art from the 1920s to the ’70s. Soon after Calderwood enrolled in 1996 as a painting major, she took an elective class in enameling; she changed her major the next semester. 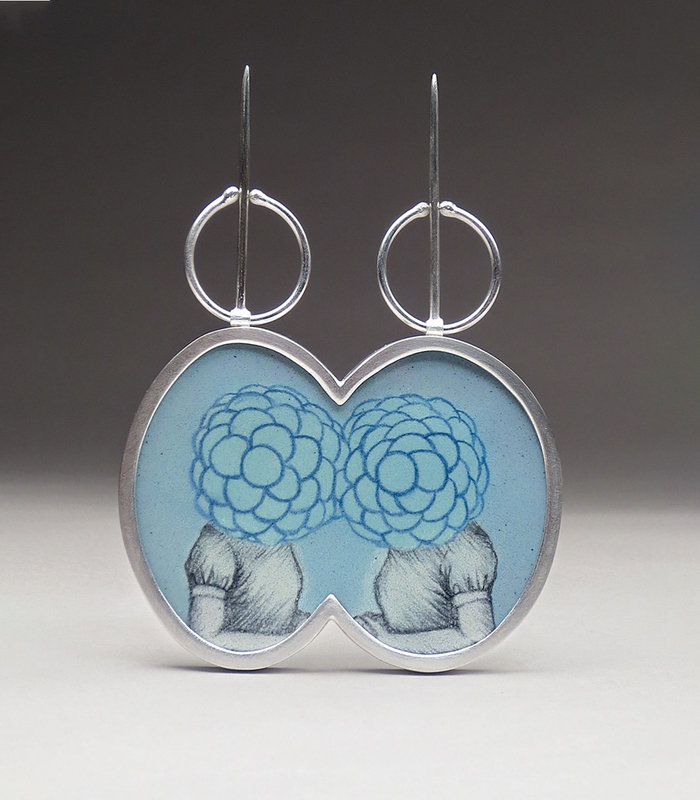 She began exhibiting her work as an undergrad, then earned her MFA in metalsmithing at Arizona State University. 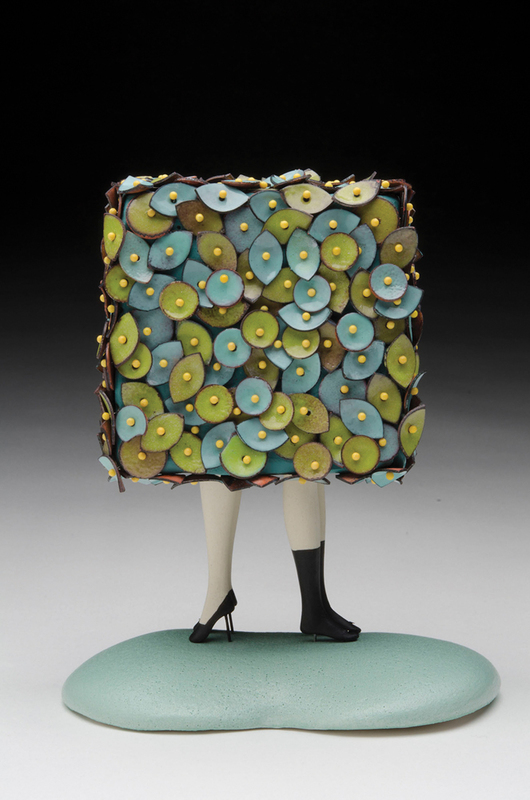 Her work made the cover of Metalsmith magazine her first year in grad school, boosting her career as she steadily made a name for herself in the various worlds of enameling, jewelry, and fine art while experimenting with material and scale. In 2002 and 2014, she was an artist-in-residence at the John Michael Kohler Arts Center arts/industry program in Wisconsin, where she was able to re-create her figures as life-size cast-porcelain sculptures. In 2016, she became the head of metals and jewelry at Ball State University in Indiana. 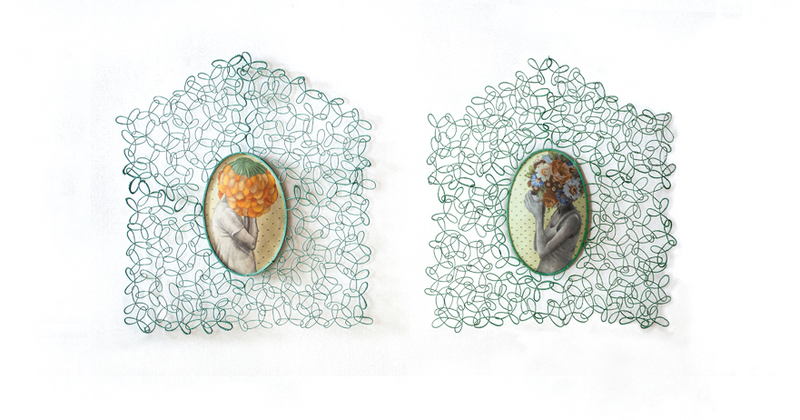 Today, in her newly built backyard studio – “my dream forever,” she says – Calderwood alternates between enameled wall panels and jewelry (almost always brooches, because they’re good miniature canvases and easy to wear), doll-like china floral figures, and the occasional large installation, often with elements of fiber, polymer clay, and found objects. In her art, she offers an allegory for our age of online personas and virtual reality, where it seems the more exposed and linked we are, the more we’re obscured and misunderstood. But it helps to see that not all of Calderwood’s figures are desolate. Sometimes she shows us a couple, secluded in a moment of tender, passionate, physical embrace – as if to suggest that maybe, in the end, the answer is love. 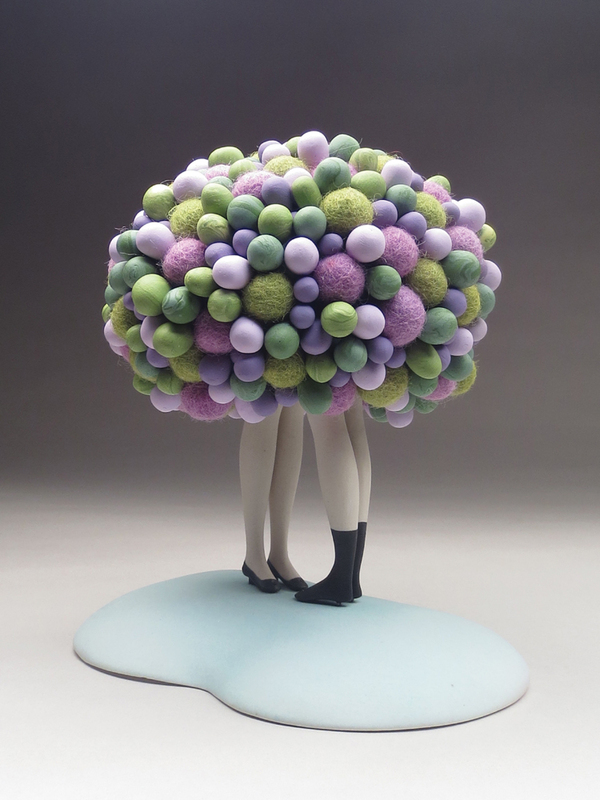 A solo exhibition of Jessica Calderwood’s wall and sculptural work will open at Tory Folliard Gallery in Milwaukee on June 7.